Growing up in the countryside in the south of Sweden I didn’t realise how lucky I was to grow up in such an idyllic place. Fast forward to present time living in a big city, where getting fresh herbs and locally grown vegetables can be quite tricky at times. So my first night in Sweden this summer I cooked us a fairly standard summer meal of pork fillet, salad and potatoes. Normally I would cook the meat on the barbecue to get that charred flavour, but due to the first barbecue ban in my life time (even in your own garden – it was that dry) I had to make do with the stove and oven. And sitting outside in the sunshine it was still a lovely meal. Mainly because of the sauce I literally threw together on the spot. It’s a simple cold sauce with mainly creme fraiche and a little mayonnaise as a base (us Swedes make sauces like this ALL the time), but what made it so nice was the mix (and quantity) of fresh herbs from the garden. An absolute treat for this city girl and something I used to take for granted when I lived at home. Mix creme fraiche and mayonnaise. Then add mustard, honey, garlic and herbs and leave for a while for the flavours to develop before serving. Season to taste. Bleak roe, i.e. Swedish caviar, is a treasured ingredient in Sweden and something I can really long for. We eat it with devotion and save it for special occasions. I always make sure I have some, for emergencies, in my London freezer, and try to eat it regularly when I go home to Sweden to visit. Luckily we’re more or less feasting the whole time I come home as my parents and I are so happy to be together. My only “problem” with bleak roe, is that I under no circumstances want to mess it up. Therefore I often serve it like a ‘toast‘ with butterfried bread, creme fraiche or smetana and chopped red onions. Because, as we now, less is sometimes more. But it’s equally lovely as a topping for crisps (it’s the perfect snack to accompany a glass of champagne) or served with crispy rösti as a starter. When I was last home in May, we decided to branch out to pizza. A pizza bianco though as the tomato would rival the bleak roe too much. And, as you can probably guess, it was wonderful! I used a recipe from a restaurant in Stockholm famous for their bleak roe pizza (or löjromspizza as it’s called in Swedish) but made a few minor changes to it (because I simply can’t help myself). Translated from and adapted after Taverna Brillo’s recipe. Ina mixing bowl, dissolve the yeast in the water. Add salt, olive oil and flour. Knead the dough by hand for 15 minutes (or in a machine for 10 minutes). Divide into two, cover and leave to rise until doubled in size, approx 30 minutes. Roll out the dough and shape into round pizzas. Place on a parchment paper covered baking tray. Heat the oven to 250°C. Spread 4 tbsp creme fraiche onto each pizza and divide the mozzarella (in chunks or slices) and präst/cheddar cheese. Bake in a low oven for 8 minutes. Remove from oven and top with bleak roe, creme fraiche, onions, chives, dill and lemon. Happy New Year and all the best for 2017! I hope to post more frequently this year and first up is this lovely recipe for oysters au gratin. This creamy topping and a few slices of baguette is all you need to start off a meal, and it was also the starter I made on Saturday, for my last dinner back in Sweden with my parents. They prefer cooked oysters to au natural and loved these! With a heavy main course two oysters were enough as a starter, but with a lighter main I would recommend three per person. Open the oysters with an oyster knife and discard the top shell. Cut loose the oysters but keep on the shells and place in an ovenproof dish,. Mix creme fraiche, parmesan, lemon juice and spices in a bowl and spoon over the oysters, Place under the hot grill or in a very hot oven (225C) until bubbly and a little brown, approx 3-5 minutes. Serve with baguette and tabasco. In Sweden, coming up with new yummy ways to serve bleak roe, is almost a sport. And when I saw this genius idea on Foodetc’s instagram; serving bleak roe and it’s best friends creme fraiche and finely chopped red onions on crisps I just had to try it. And it turns out crisps are a great vehicle for the bleak roe. They’re crispy and light and has the same effect as rösti and butter-fried bread. So good! Find the prettiest crisps in the bag and put them on a nice plate/platter. Top with small dollops of creme fraiche, add bleak roe and lastly finely chopped red onions. You’re probably familiar with Toast Skagen; the iconic Scandinavian starter consisting of butter-fried bread (oh yeah!) topped with a mixture of prawns and dill in mayonnaise?! It’s a true classic that will never go out of style. And so very delicious. My mother serves it at dinner parties and so do I, and sometimes I make one for myself just because I feel like it. But this thing of placing things on top of butter-fried bread is bigger than just this one dish. It’s a whole food category. And I’m pleased to say I have discovered yet another recipe to add to my repertoire; this wonderful Toast Lingström with ham, named after its inventor, chef Christer Lingström. The combination of smoked (or cooked) ham, creamy mayonnaise and a little tartness from the creme fraiche really works with the heat from the horseradish. It’s such a great little starter. Or nibble, in which case the recipe below is enough for 8 nibbles. Just cut the bread slices in half. Adapted from Christer Lingström’s recipe. Slice or dice the ham and mix with creme fraiche, mayo, chives and horseradish. Season to taste. Cut the crusts off the bread slices and fry in butter until golden. Drain the excess fat on kitchen towel. Divide the mixture between the four bread slices, garnish with some more chopped chives, if you like, and serve. The combination of caviar, red onions and creme fraiche is a real classic for us Scandis, so much so it features in two subsequent posts here on the blog. The cheaper lumpfish roe or salmon roe can be found in most supermarkets in the UK but my favourite roe is the bleak roe from Kalix in Sweden. It’s just delicious and I import a few packs to keep in the freezer on most trips to Sweden. 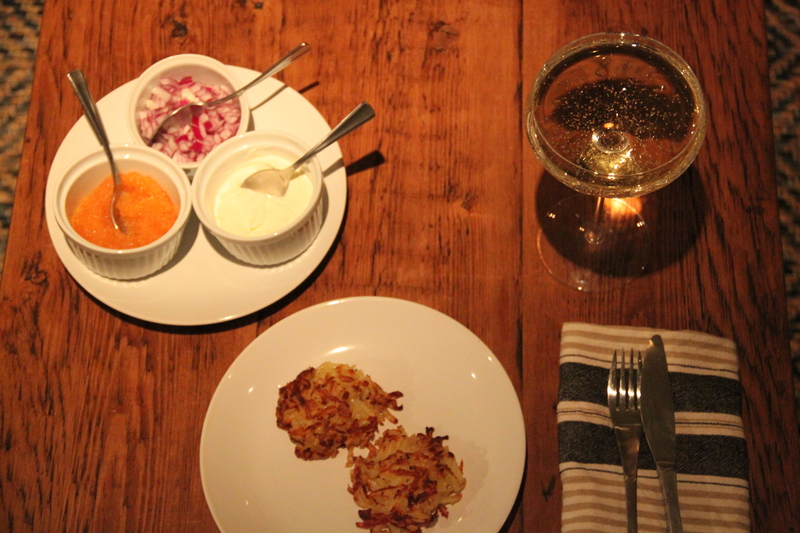 It’s best served in a simple way to enjoy the produce the most, like with rösti, red onions and creme fraiche. Last time I had this was just a regular Friday when I was staying in and felt like treating myself both to the roe and a glass of bubbly (since it’s such a wonderful combination).